Paradrymonia is a genus of about 10 species of desirable, decorative plants with succulent leaves and flowers that are usually white, cream or yellow. The margin of the corolla lobes is notched or fimbriated. The genus is closely related to Nautilocalyx, Chrysothemis and the newly resurrected genera Centrosolenia and Trichodymonia. Paradrymonia has been riddled with taxonomic confusion since a few years after its establishment. Hanstein established the genus in 1854 by transferring Centrosolenia glabra, a species described by George Bentham, to Paradrymonia glabra. However, it was short-lived because 11 years later, Hanstein himself changed his mind and put it as a synonym of Episcia. More than 100 years later, Hans Wiehler re-established the genus by transferring 18 species from other genera such as Episcia, Drymonia, Alloplectus, and Hypocyrta. Wiehler justified the resurrection of Paradrymonia because he considered that this group of plants were distinct and recognizable by their oblanceolate, anisophyllous leaves, with flowers usually congested at the base of the leaves. With the advent of molecular data, many genera in the tribe Episcieae (now known as subtribe Columneinae), have been re-circumscribed. DNA has revealed that the apparent similarity between many of the species is due to adaptations to similar ecological conditions (e.g. pollinators), and not to common ancestry. Since the main objective of classification is that it reflects evolutionary relationships, many taxonomic changes have been made in recent years. For this reason, Paradrymonia was re-circumscribed recently by Mora & Clark (2016) by resurrecting the genus Trichodrymonia and transferring 25 species previously in Paradrymonia. Species currently recognized as Paradrymonia are: Paradrymonia barbata, P. buchtienii, P. campostyla, P. ciliosa, P. glabra (the type species), P. lutea, P. tepui and P. yatua. Most of the species of Paradrymonia and Trichodrymonia share the epiphytic-rosette forming habit and the presence of anisophyllous, large, coriaceous, lanceolate to oblanceolate leaves with decurrent bases on the petiole. The main difference to distinguish among these taxa is the presence of bearded anthers and fimbriate corolla lobes in Paradrymonia (with the exception of P. campostyla and P. barbata, where bearded anthers are absent). 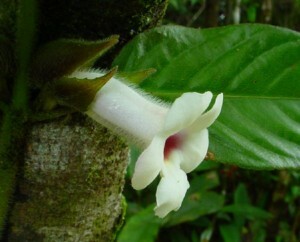 In general, Paradrymonia should be grown in a manner similar to other terrestrial gesneriads. A moisture-retentive, but not too heavy medium is required, as are fairly warm temperatures and humidity as high as can be managed.